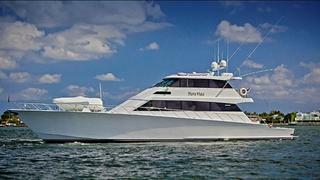 The 28.35 metre sportfish motor yacht Pura Vida is offered for sale by Lon McCloskey at Worth Avenue Yachts. Built in aluminium by Broward Marine, Pura Vida was delivered in 1996. Accommodation is for 10 guests in four cabins consisting of a full beam master suite with a king sized bed, a VIP suite and two twins, each with a Pullman berth. All cabins have television sets, entertainment systems and full en suite facilities. Immediately upon entering the main saloon is a storage cabinet to port and a curved stairwell to the flybridge. To starboard is an entertainment center with a 36 inch Sony television along with CD and DVD systems. A custom L-shaped sofa provide seating for six to seven guests while the dining area forward has an oval rustic dining table seating eight in large wooden chairs. On the flybridge, the helm station is full beam and has a Stidd helm chair. Aft to port is an entertainment center housing a 27 inch television and VCR. Opposite to starboard is a raised U-shaped sofa with storage underneath while an adjacent cabinet provides more storage and houses a small refrigerator. There is a centre doorway to the flybridge aft deck that features port and starboard L-shaped seating. Power is provided by twin 725hp Detroit Diesel engines. Currently en route to Palm Beach, Florida, Pura Vida is asking $1.8 million.